wikigeo allows you to fetch geojson for Wikipedia articles around a given geographic coordinate. 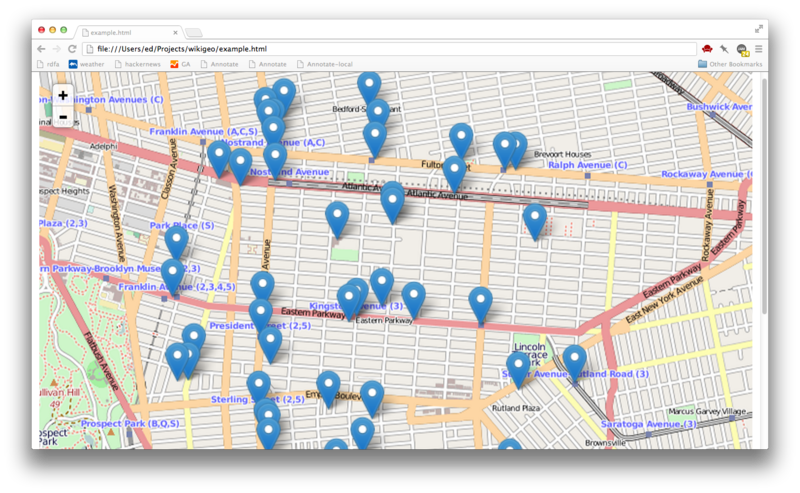 It can be easily added to a map using Leaflet's geojson support. The data comes directly from the Wikipedia API which has the GeoData extension installed. "name": "Kingston Avenue (IRT Eastern Parkway Line)"
"name": "Crown Heights – Utica Avenue (IRT Eastern Parkway Line)"
"name": "Paul Robeson High School for Business and Technology"
"name": "Pathways in Technology Early College High School"
"Commons category template with no category set"
"Articles with dead external links from January 2013"
Please note that the order of geo coordinates in Leaflet is (lat, lon) whereas in geojson it is (lon, lat). That's it, to get the basic functionality working. Open example.html for a working example.